October 15, 2010 by Alphageek in "alphageek", "review", "urbanspoon"
A good cup of coffee. That makes this review easy to write. We were trying to avoid massive traffic tie ups on I64 and were driving somewhere new. 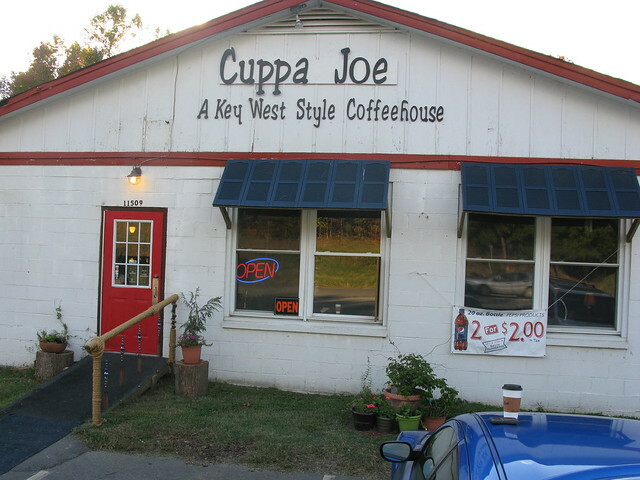 Along the way, we made a great discovery: Cuppa Joe. We stopped in when it became evident we were going to need a little more caffeine than usual to complete our trip. We were not certain what we would find in this all alone sort of building, but we are glad we stopped. I was able to get a cup of yirgacheffe coffee. Not everyone recognizes the quality of this coffee, but Cuppa Joe not only carried the coffee, they had some already brewed and ready to enjoy. This coffee is something that I cannot get just anywhere, and shows this place is more than worth a stop if you happen to pass by, you should make a point of stopping in. I know we will, if we pass that way again.